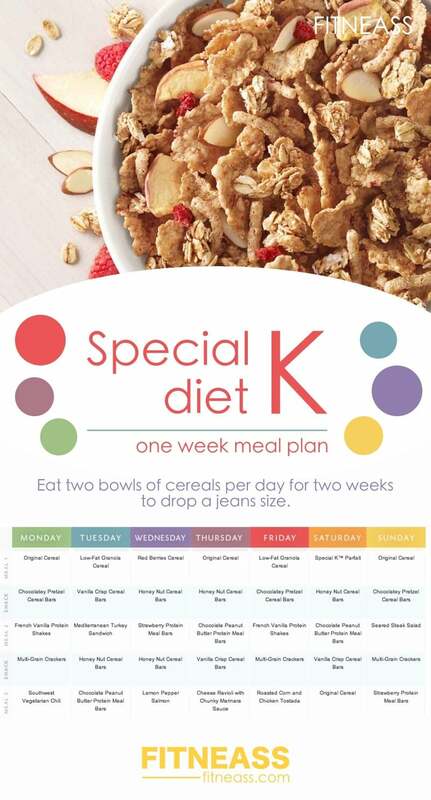 The Special K diet is an unusual slimming plan that encourages you to eat cereals all day long. Well, almost all day long. 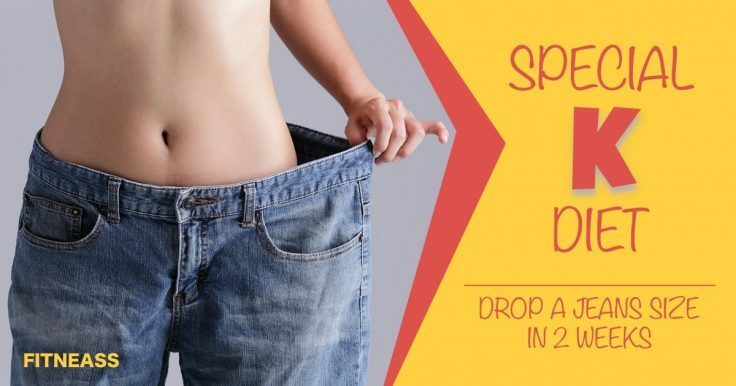 Because of its simplicity – just eating cereals and losing weight – this diet gained popularity real quickly among the busy women who are struggling to shed a few pounds. Don’t worry, the Special K diet is not just for the ladies. Anyone, man or woman, who is overweight can follow this diet. Yes, you heard it right! You should not embark on this weight loss plan if you have a BMI smaller than 25. To calculate your own BMI, check this article. Since the Special K diet is low in calories (less than 1600 calories per day), it is not recommended for pregnant women. Also, the recommended dieting period for this program is 2 weeks. And because of this limitation, the Special K diet is considered more of a quick fix rather than a solid and long-term weight loss diet. Anyway, it was previously tested by participants in a study conducted by Dr Robin Hooper at the Loughborough University, and published in 2003. In this study, people that followed the Special K diet lost anywhere between 2 and 5 pounds over the 2-week period. Also, more than 75% of them lost inches from their waist, thighs, hips, busts, or arms. And 33% shrank their waist with at least one inch. I would say these numbers are pretty good for such a simple and easy-to-follow 2-week meal plan. And speaking about the meal plan, all you should eat for two weeks is cereals for 2 of your 3 meals a day, and the third can be a normal, healthy meal. But let’s see in detail what you should eat when you’re following the Special k diet. Maybe you’re wondering where does the “K” form the Special K diet came from? Well, it’s from Kellogg’s products. So yes, they developed a diet based on their products to eventually increase their sales. Pretty smart, right? Now, I’m not trying to sell nor promote their products, and I’m pretty sure this diet works with other low calorie cereals as well. Just try a quick search on Amazon to find lots of other options. Eat a bowl of cereals (1 cup) with skimmed milk (1/2 cup) for breakfast. You can also drink a cup of coffee or tea (without sugar). You can have a fruit as a snack. Eat a bowl of cereals (1 cup) with skimmed milk (1/2 cup) for breakfast. You can opt for a different cereal flavour than the one from your breakfast. You can have a veggies or a low fat cereal bar as a snack. Your dinner should be a healthy, light and nutritious meal of your own choosing. Make sure you include veggies and/or fruits for an added nutritional boost. Breakfast: A bowl of Special K Bliss Strawberry and Chocolate with a half cup of skimmed milk, plus a cup of coffee or tea. Lunch: A bowl of Special K Red Berries with a half cup of skimmed milk. Snack: Carrot sticks, sugar snap peas, or a Special K Bar. Dinner: Grilled salmon, boiled new potatoes, broccoli, carrots, and peas. Snack/Dessert: A medium banana with a low-fat yogurt, or a bowl of fresh fruit salad. You can easily find all Special K cereals, protein bars and shakes on Amazon. 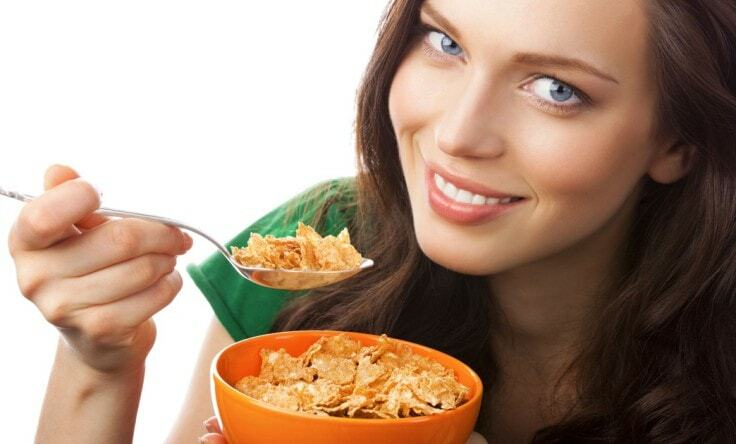 Again, you can also opt for other low fat cereals, as long as you follow all the guidance in this article. You should exercise at least 30 minutes every day for the two weeks of the Special K diet. Go for a 30-minute walk, do yoga, or maybe try swimming. No matter what activity you choose, just make sure it lasts at least 30 minutes. You can find some delicious Special K cereals based recipes here. Kickstart your Special K diet with 20 science based weight loss tips as well as 50 weight loss strategies. It’s simple and very easy to follow. Real scientific studies proved its effectiveness. You’ll be hungry most of the time. Since you’re gonna eat mostly cereals, you may get bored of the Special K diet easily. Your body may lack some important nutrients, even though the cereals contain minerals and vitamins. Special K cereals are low in fiber, so you need to get it from your dinner. So make sure to add whole grains (such as brown rice) and veggies to it. You can easily regain the lost weight when the two week period of dieting is over. The Special K diet is a short term solution for when you need to drop a few pounds before an event. You may use it to drop a size or two before your wedding, or to get your flat belly back before going to the beach for the first time this summer. Similar to any other quick diet out there, the Special k diet has good and bad parts. Even though it lacks some nutrients and it doesn’t always curb the hunger pangs, isn’t eating cereals a healthier alternative to burgers, pizzas and French fries? Of course it is! So the truth is, the Special K diet is better than what most of us eat on a daily basis. But, on the other side, incorporating a healthy diet, rich in lean meat, vegetables and fruits, may be a better solution for weight loss.